This weekend is filled with fight cards galore and Bellator closed out its event in WinStar World Casino and Resort, Thackerville, Oklahoma, Bellator 210. David Rickels came through again with another savage brawl and Unanimous Decision win to boot. He returns to the win column following a lose to Micheal “Venom” Paige at Bellator 200. These boys are going at it! #Bellator210 is live now on @paramountnetwork! Brian “The Pikeman” Moore broke both hands in a losing effort to his opponent. The fight started well for the Irishman as he landed early and often but soon injury stifled his boxing. The SBG fighter is know for his crisp hands and once they were removed from the equation it proved difficult to mount effective offense. Noad took the momentum of the fight in the second and third and won the fight by unanimous decision. Despite breaking his right in the first and his left in the second he made it to the final bell. 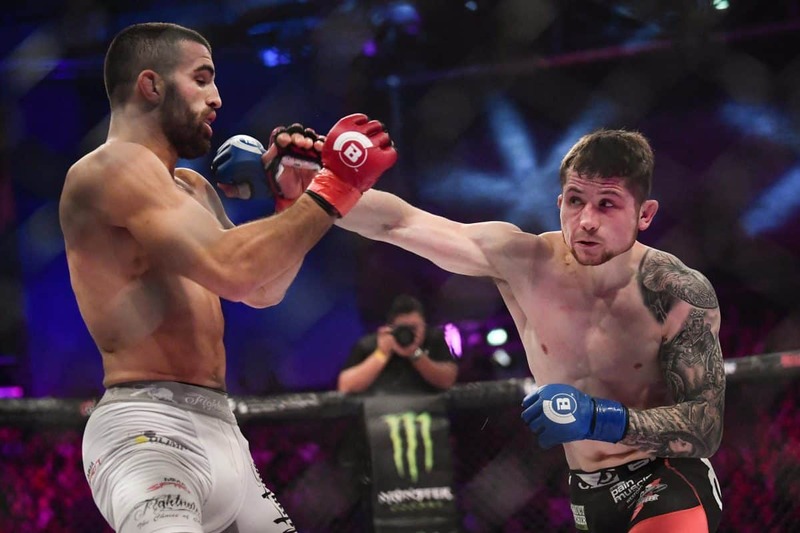 Juan ‘The Spaniard’ Archuleta continued his climb up the Bellator Featherweight ladder with a strong showing against Jeremy Spoon. He displayed explosive striking that blends into his wrestling game to nab himself a decision victory. He trains with UFC Veteran Cub Swanson and the current UFC Bantamweight Champion TJ Dilashaw. John Salter def Chidi Njokuani Submission (Rear-Naked Choke) Round 1 4:32. David Rickels def Guilherme ‘Bomba’ Vasconcelos Decision (Unanimous). Kristina ‘Warhorse’ Williams def Ellen Bruna Decision (Unanimous). Juan ‘The Spaniard’ Archuleta def Jeremy ‘Spooner’ Spoon Decision (Unanimous). Costello ‘The Spaniard’ def Chris ‘The Cutt’ Honeycutt Decision (Split). Jordan Young def Anthony ‘A-Train’ Ruiz Submission (Rear-Naked Choke) Round 1 3:48. Goiti Yamauchi def Daniel ‘Drake’ Weichel Decision (Split). Shawn ‘Bunch the Great’ Bunch def Joe Warren TKO (Submission to Punches) Round 1 1:42. Mike ‘Seabass’ Shipman def Scott ‘The General’ Futrell Submission (Anaconda Choke) Round 1 2:58. Noad ‘Neo’ Lahat def Brian ‘The Pikeman’ Moore Decision (Unanimous). Adil ‘Gloryboy’ Benjilany def Daniel Carey TKO (Head Kick and Punches) Round 2 0:43. Gerald ‘Hurricane’ Harris vs. Hracho ‘Hracho Man’ Darpinyan Draw (Majority). Rudy Schaffroth def Vernon Lewis KO (Punches) Round 1 2:51.